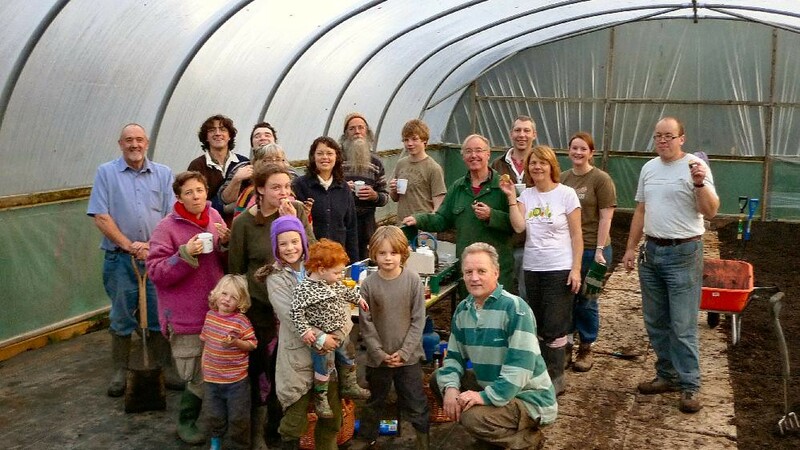 As usual, our annual polytunnel tidy was enthusiastically carried out in the depths of winter with plenty of goodwill and companionship. It is all so organised now that there is twice the space there used to be. Now that's magic. cropsharer to give to a friend whom they thought might be interested in joining us. It was quite a sophisticated operation to put together - don't the boxes look inviting! A few people took out our trial offer as a result. shared by those who came and helped. Keith made an excellent shire horse! (I guess they pull rather than push though). And the potatoes? - I had one that weighed a whole kilo this week! Creating a sunflower hedge was the main job in the field that Sunday, as you can see in the photo. Our treasurer Keith had to put off tidying up the stone pile by the gate, as we found a pheasant sitting on a dozen eggs! We also showed a potential crop sharer around the site. As well as planting the first early potatoes, we moved the bike wheel den to it's new home with a nice new, clean (so far!) floor. Several of the community met on a warm Autumn Sunday to help harvest and store our maincrop potatoes. Quite different from our first spud harvest, where we only had forks for the task, now we use our hand tractor with a special potato lifting attachment, which scoops them up to the surface. Before this however, we removed the stalks, and picked up any large stones, which would have slowed the tractor down. Once the tractor had gone by, we moved in, sorting into 3 grades: the good potatoes for storing, which we spread out on a large tarpaulin to dry in the sun; those damaged by the machine or insects, which would go into the next week's harvest for immediate use; and finally any unusable ones, due to being green, slug eaten beyond use or too tiny. After lunch, which featured Elspeth's delicious Leek and Potato soup (and other tasty foods that people brought along to share), we started bagging the dried potatoes up into large paper sacks: these would later go in our vegetable store. Up at the farm, where the Community Food event was going on, some of our committee members were manning a stall to attract new crop-sharers, whilst providing art activities for children, and using a press to turn some of the farm's surplus apples into refreshing cloudy apple juice, which was offered to people visiting the stall. A productive day - lots of potatoes got planted and lots of weeds got removed. A few scarecrows have been revamped and some (half) made - we now have a Darth Vader without hands and lightsabre, and a pregnant looking lady with no head...All in good time! 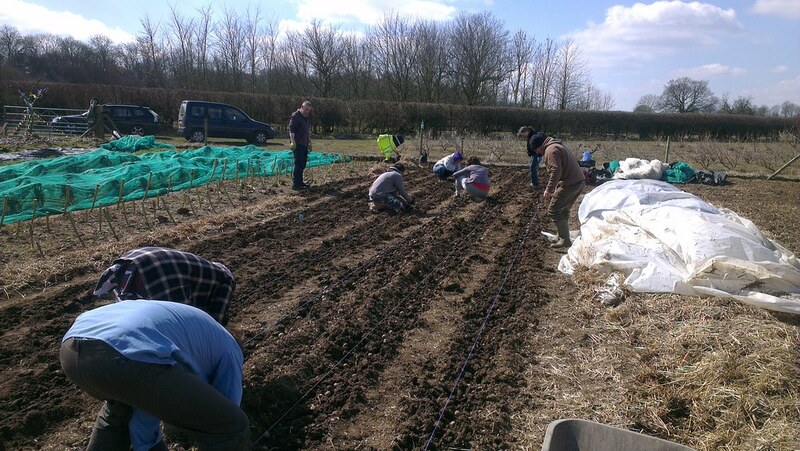 Early Potato Planting day 6th April - An account from Elspeth, a member of the CHW Committee. We had a great day. The weather was gorgeous, and lots of people turned out to help. We planted all the early potatoes, and got a lot of onions planted too, and another no-dig bed dug over and covered in compost. Thanks to all of you who came and dug and planted and barrowed and weeded and ate and laughed – what a lovely way to spend a sunny Saturday. On a more frivolous note: the shoe tree has been resurrected and is looking it’s old cheerful, colourful self again. And it now has company! A row of bird-scarers, dressed up in their summer finery, are making the field look very lively. A big thank you to the Gough girls and Scarlett Searle, for doing a grand job! We look forward to more fun on Sunday the 28th, when we’ll plant the maincrop potatoes, and make some proper scarecrows. If you have any groovy outfits you’re willing to donate, do bring them along. We’re planning to make a Darth Vader one, complete with lightsabre.... See you there! Elspeth. Toby in charge of burning what didn't get shredded for the pah - Nice job, huh? Meanwhile outside.....Dani and John feed the brash from the tree 'trimming' into the great orange gobbler. John is obviously dancing to whatever is playing in his headphones. Or perhaps those are ear defenders? Chris does the foundation work on the path up to the collection shed. As always - a shared feast to celebrate the achiWevements of the day. While all this was going on, Keith, our intrepid treasurer come odd job man (!!) climbed up into the gutters and cleaned a lot of the green stuff off the outside of the tunnel – anyone with a good head for heights and long arms is welcome to come and do the rest! The end result, a spanking clean polytunnel, and a safe, cropsharer-friendly path up to the weekly vegetable collection point. Thanks everyone!! The path, complete with paving slabs, homemade 'shred' from the gobbler, and in the distance...... ....the reclaimed decking outside the collection shed. The finished article: an all-weather path running alongside the polytunnel. This is quite an improvement! 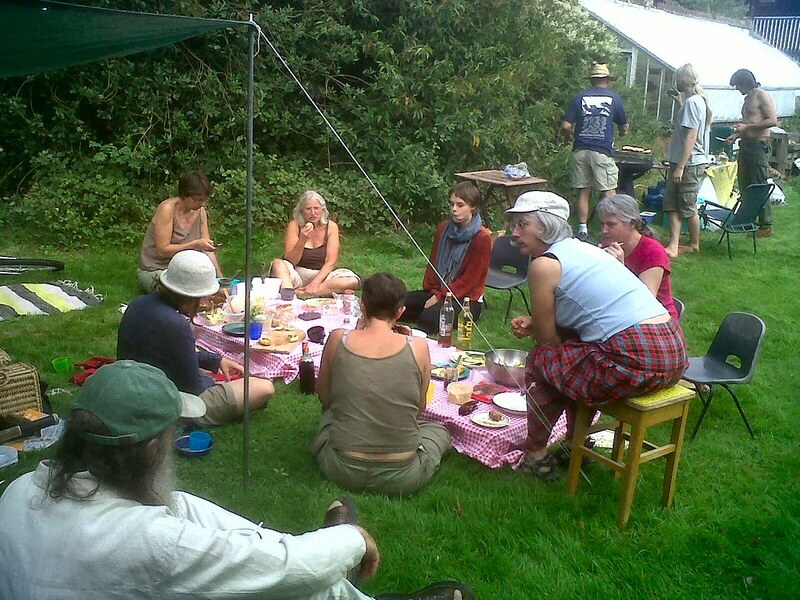 Wassail Day - Sunday 6th January 2013 - An account from Elspeth Campbell, one of the CHW Committee Members. Eight tons of compost was shifted from a big heap by the gate by the tearooms to a big heap in the field. Keith operated the digger and quad-bike, many people wielded spades and wheelbarrows. Also people cleared and weeded some ground for spring planting. We made colourful shakers from recycled materials in the nice warm tearooms, where we also had a shared lunch of soup, bread and cheese, salads and cakes – very good! ... Tom and Tina, cropsharers and amateur storytellers, delighted us with tales of adventures in exotic places. Sandra lead us in some singing: we practiced ‘The Wassail Song’ in the tearooms, before heading out with our shakers and making our way around the field, singing and shaking. Luckily the song has many verses, so singing it twice got us all the way round! 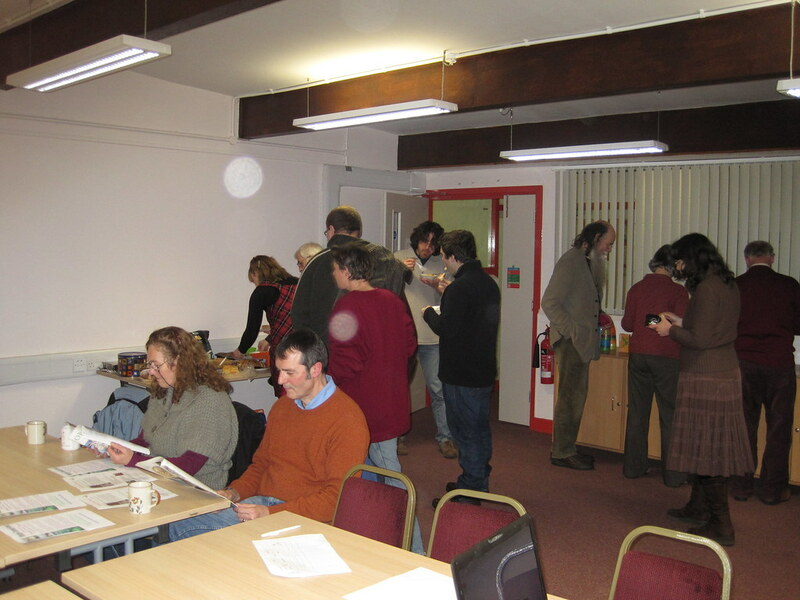 Many people came and helped to make the day a success. Many couldn’t stay for the whole day, some came late, but all contributions were much appreciated, including the family who arrived just on time to inject some fresh energy into the singing. Toby’s comment at the end of the day was that it was the best Whetstone day he’d had. 3: Both piles have come together. The weeds and heap have been removed and the soil is being raked level. 4: The girls have found a way to keep their footwear protected! The area being transformed is covered with pre-used plastic to suppress weed growth. 6: Whilst the groundwork is being done by half of the group with Pam, the other half are getting creative under the gazebo with Cat Bellinger. 7: Used plastic bags and juice bottles are cut, plaited, heated and generally transformed into colourful flowers and greenery. 8: A 'fruit shoot' flower. 10. A Free-form plastic flower. Adornments attached with wool & tape to a 'tree', which then gets 'planted' in the stone garden. If this doesn't scare the birds, nothing will! One of the scarecrows in action. the pre-existing garlic beds... railway and back via the large ponds (above). A couple of weeks into the new year, and CHW members met to see a documentary called 'A Farm for a future', about the need to change modern farming into a more sustainable method of food production not reliant on fossil fuels. young winter salads were then planted into the worked soil in rows. the core group and a question and answer session.